Welcome to our last blog post of the winter term! In today’s Friday Feature, we are bringing you sixteen DH positions and CFPs, as well as seven upcoming DH events. Before we depart for spring break, we want to give you a heads up that on April 5, the first Friday of spring term, DH@UO, the New Media and Culture Certificate, and the School of Journalism and Communication are co-hosting a Data/Media/Digital Graduate Student Symposium. The symposium will take place in the new DREAM Lab, located on the first floor of Knight Library. To see the full list of graduate student presenters and the schedule, click here. We hope that you will join us! About: “The Stanford University Libraries’ Center for Interdisciplinary Digital Research (CIDR) is seeking a full-time Digital Scholarship Research Developer to build sophisticated, sustainable, and generalizable projects and platforms in order to support interdisciplinary research in the computational social sciences and digital humanities at Stanford. Regular tasks will include analyzing, designing, developing, deploying, modifying, and maintaining computer programs in systems of moderate size and complexity or segments of larger systems. Analysis of HathiTrust content in combination with other data sources. Institution: Paladyn, Journal of Behavioral Robotics. 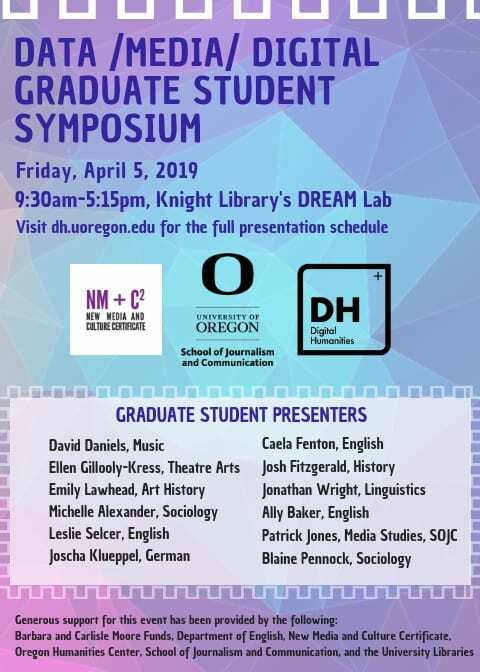 About: Please join us for the Data/Media/Digital Graduate Student Symposium, a one-day symposium on Friday, April 5, 2019 that will be held in the Knight Library’s new DREAM Lab collaborative workspace. Presentations will be based on work in progress or on research and work in the final stages of development. This event will give us an opportunity to showcase exciting multi-disciplinary work being produced by graduate students across campus. their training with expert guest lectures.